Christmas Point situated on the very north-western point of Similan island 9 (Hoh Ba-Ngu), just south of Rocky Point, is a great boulder liveaborard dive site and known for its famous swim-through at 24 meters. It consists of a cluster of submerged boulders except for one pinnacle visible from the surface. Underwater, huge granite boulders are stacked in groups on a sandy seabed. The further northwest, the more scattered and deeper they become. Diving depths range from 10-40 meters with most of the really amazing scenery from 20-30 meters around the pinnacle. Southwest of the mooring line towards the surface pinnacle you enter one of the most scenic dive sites of the Similan Islands. 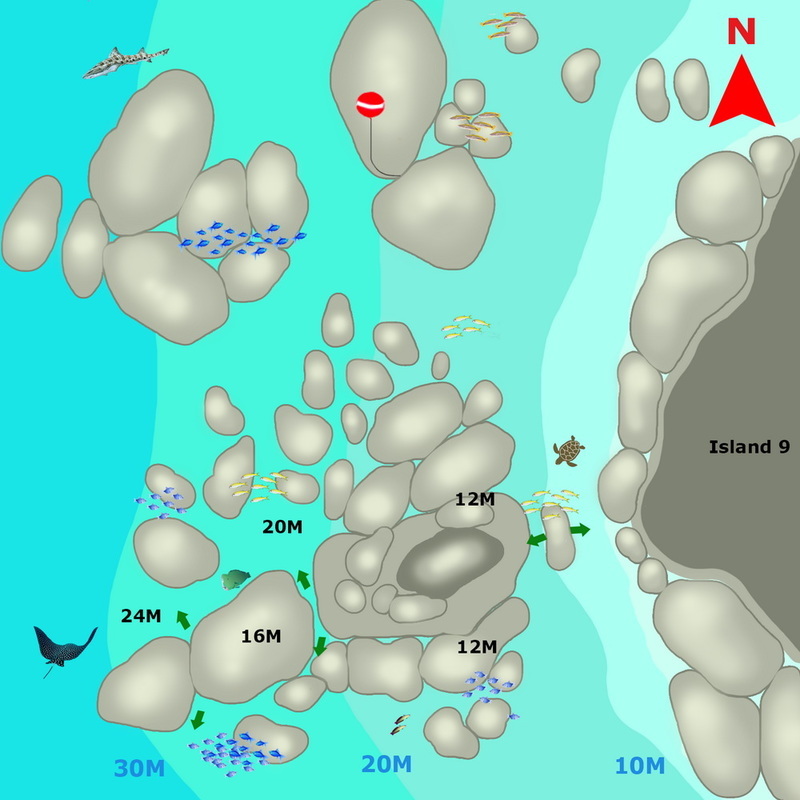 A formation of large stacked boulders dropping to a depth of 35 to 40 meters meters form several amazing swim-throughs on your descend in western direction. Some are more adventurous than others but the most famous is the arch-like at 24 meters. At the swim-throughs, groupers and giant sweetlips hide in the crevices, beautiful covered by sea fans and colourful soft corals. At the outer rock line at the depth of 25- 40 meters resting on the sand leopard sharks or whitetip sharks have been spotted here. Between the boulders keep an eye out for big fish such as Napoleon wrasse, giant trevally, great barracuda and tunas. Also, in hiding holes look closely for camouflaged ribbon eels. They are brightly yellow and blue coloured, longer and thinner than the commonly seen Moray eel. Heading back towards shore, a shallow area with a depth of 10 meters brings you over hard bush coral gardens and staghorn coral. Staghorn coral exhibits the fastest growth of all known fringe corals, with branches increasing in length by 10–20 cm (3.9–7.9 in) per year. This has been one of the most important corals in terms of its contribution to reef growth and fishery habitat. Cuttlefish, sea cucumbers, starfish and invertebrates are all over the place. 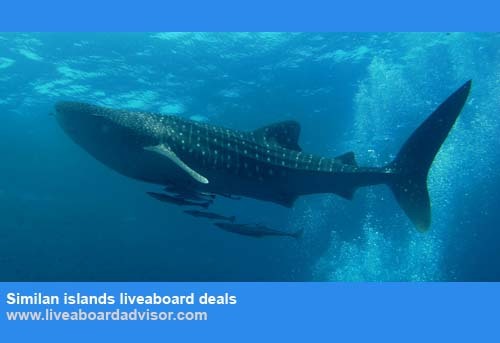 Colourful nudibranchs and small fish like purple fire goby and red fire goby will surely get your attention but do look regularly into the ocean for this is a good site to spot manta’s and occasionally whale sharks! When you weren’t already signalled by the others, share this magnificent sight with your buddies by banging on your tank. Just stay calm and enjoy. You’ll see, you will be more rewarded to the best view if you don’t chase these giant creatures. Christmas Point has an outstanding visibility ranging from 20-30 meters to more on certain days. So definitely worth to take your camera with you at Christmas Point! 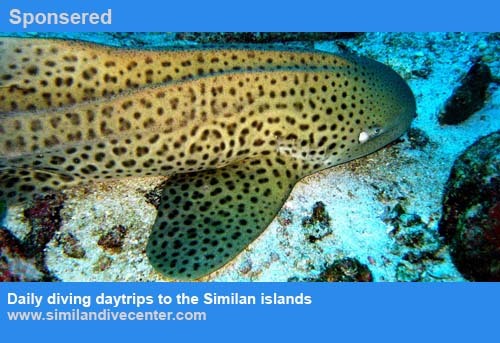 Depending on the current, this location can be done by any certified diver. Due to both current and depth we wouldn’t recommend it to beginners. Stay close to the rocks and keep an eye on your depth. When the tidal currents are stronger on certain times of the month, this site is more suited for experienced divers. Check this out before you jump in. Christmas Point lies too far out for regular scuba diving boats to access from Phuket and Khao Lak and is best reached by speedboat or liveaboard boat.